Bubaneswar: Chief Minister Naveen Patnaik , Union Minister Dharmendra Pradhan pay tributes to great freedom fighter and Odisha’s first martyr in freedom struggle Saheed Jayee Rajguru on his birth anniversary. 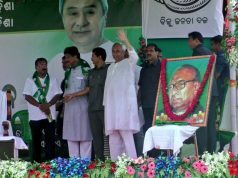 CM Patnaik said is patriotism and supreme sacrifice for the motherland will forever inspire all countrymen. 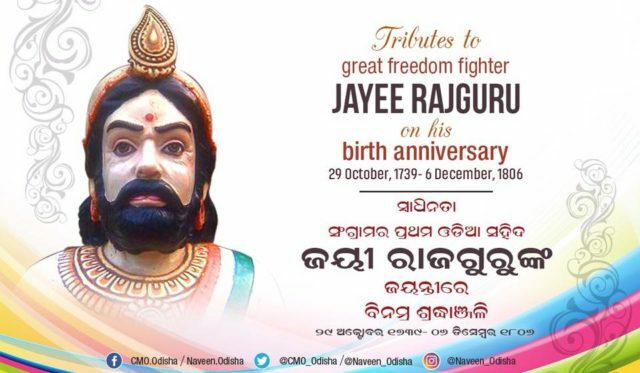 Jayakrushna Rajaguru Mohapatra popularly known as Jayi Rajaguru was a prominent figure of the Indian independence movement in the state of Odisha. 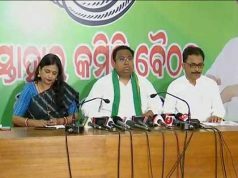 A princely-priest by profession at the court of the raja of Khurda, Rajaguru was the first person to revolt against the British Raj in the province. While collaborating with the marathas for recaptured the British-occupied province, a maratha messenger was caught by the British army and Rajaguru’s secret strategies got exposed. Upon failure of his removal from the king’s court, the British force attacked on the fort of Khurda and captured Rajaguru. He was later sentenced to death by tying his legs to branches of a banyan tree in “Baghitota”, Midnapore.